Maretron's Switch Indicator Module monitors switch closure devices including, but not limited to, safety equipment (e.g., heat, smoke, carbon monoxide, explosive vapor detectors), security systems (e.g., motion, vibration, glass break, door and port hole magnetic switches), and vessel monitoring equipment (e.g., valve closed/open, high water bilge). The SIM100 continually monitors these switch closure devices and broadcasts information over the NMEA 2000® network about the switch state so the crew can be alerted to potential conditions or problems that warrant further investigation. Advanced features of the SIM100 include the ability to detect whether or not power has been disconnected from the monitored device or if the signal wires have been disconnected due to either corrosion, tampering, or for any other reason (if the monitored device is so equipped). With the SIM100, you can rest assured that critical sensors are receiving power, signal wires are connected, and all the safety, security and vessel functions are under constant supervision. SIM100 output information is then displayed with networked NMEA 2000® equipment such as Maretron's DSM250 or DSM410 dedicated displays or with NMEA 2000® compatible software such as Maretron's N2KView®. Best of all, the SIM100 is NMEA 2000® certified so you can view any and all switch indicator status anywhere on the vessel using a compatible NMEA 2000® display. 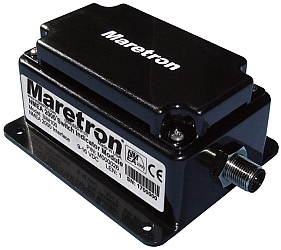 The SIM100 is a key component of Maretron's N2KView® vessel monitoring and control system. To reduce the chance of false alarms, the smoke detectors should be located in an environment with an ambient temperature between 32° F (0°C) and 100°F (37°C) and humidity between 0 and 95% non-condensing. See the above manufacturer's installation instructions for full location guidelines. Passive Infrared Motion Detector (PIR). Detects when a vacuum goes over 7" Hg (3.4 PSI or 0.237 bar). When connected to a fuel supply, this corresponds to the excess vacuum required when filters are clogged.